The logical response to this phenomena is that lack of oxygen and the consumption of various drugs can do crazy things to the brain. Who knows what can occur when a person is hanging on by a thread? As we neared the last days of my mom’s life, I so wanted to understand what she was feeling and seeing. The day before she took her last breath I decided to ask her. First I wanted to make sure she could comprehend what I was saying. I told her I loved her, and she raised her eyebrows in acknowledgement. Then I shared a funny story about a conversation my sister and I had. The corners of her mouth turned up in a smile. I could tell that she was taking in every word. “Mom, can I ask you a really serious question?” She turned her head and opened her eyes fully. I could tell she wanted to grasp every word that came out of my mouth. “Do you see your mom,” she shook her head. “Is he here in this room right now?” she nodded. “Can he see me?” she nodded again. And then she tried to communicate with words, but was frustrated when she couldn’t get the words out. I could tell she wanted to share her reality with me so badly. The next day mom was in a different realm. She wasn’t responding to me or my family members, yet she was having full-on inaudible conversations with a being I couldn’t see. Maybe my dad? At times she would become quite animated, speaking deep within her throat and making guteral sounds. At one point, she kept shaking her head and saying “no.” It was obvious she was fighting something. I sat down next to her and tried to hold her. My sister also came into the room to let mom know she was there. I then called my brother and let him say hello. Shortly thereafter, mom began having conversations again. When she spoke to the invisible being this time, it was as though they were having a cohesive conversation — one that I still couldn’t understand because by that time her vocal chords were shot. She’d talk and then listen and talk again. It was as though she was trying to make sense of what she was being told. The conversation ended, and a bit later her body constricted. Her brow furrowed. Then something profound happened. Her soul (the mom I loved and treasured so much) completely left her body. Her body continued to breathe, but there were no more conversations. No more frowns or grimaces when you’d adjust her legs or back. What I saw led me to conclude that she finally agreed to go. Could it be possible that she went with my dad? That he was sent to take her away and keep her safe along the way? While I can’t be certain, this is what it seemed to be. According to David Kessler, author and expert on death and dying, the following things often happen when a person is about to die. The dying are often visited by their dead mothers. 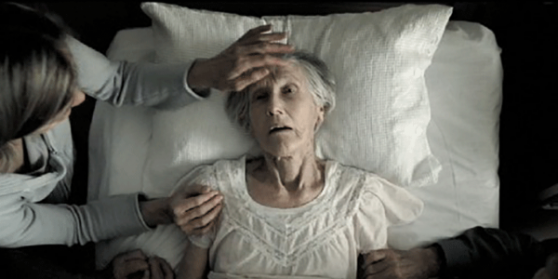 Family members and friends of the dying can’t see their visions or participate in conversations. Visions often occur hours to weeks before they die. While there is no “proof” that their visions and communication with deceased family members or friends are real, some death and dying experts are adamant they should be taken seriously. Following the death of my Mom, I am more open to the idea that something amazing (like my father being there to take my mom away) may occur. The experience is one I can never forget — and honestly I never want to forget. Just a few weeks ago, I was wondering why I haven’t had many dreams of my mom since she died. As I was driving home from work, I said out loud, “Mom, it’s about time you come and visit me in a dream! Where are you anyway?” I then laughed it off and enjoyed my drive through my favorite canyon. That night while I was sleeping, it happened. I had one of the most lucid dreams I’ve had in a long time. Mom was dressed beautifully. She peered at me with a HUGE smile. Her eyes were bright and full of life. She was happier than I had seen her in years. And she was younger, maybe her 45 or 50-year-old self. We didn’t exchange any words, but it was clear that she is healed, happy and free. I woke up with joy in my heart. Next Article Next post: Are Your ‘Mental Frequencies’ Ruining Your Life? My two best friends passed last year and I just lost my step dad Tuesday. I also was an STNA for 25 years and was there with many of my residents as they passed on. I also believe that our loved ones do come to get us and help us let go and take us to the other side deff. If they don’t want to go. I have seen the reaching and heard the conversations as well. it’s a wonderful comfort to know that the one I love and lost were not alone on their journey. So beautiful. I had a very similar experience with my brother. Very very similar. My parents were with him a few hours before his soul went to heaven. There were mourning doves (2 near his window) and they would not leave for several hours. Also even though he was unconscious he communicated to me. And also about a week after I had a similar dream in which he came to me and put his big arms around me and told me he was happy. He said that I could never understand and he wanted me too, so when he put his arms around me I felt happiness like I had never experienced here on earth. I look forward to seeing him and my other family members in heaven one day. Thank you for sharing. This is real. I have had others tell me and I have experienced it firsthand myself. I had a couple of very lucid dreams of my father after he passed as well as two other people. In each dream, the person looked younger and was smiling. I felt a lot of joy and peace in these dreams, and I can still remember every detail. Thank you for writing this article. I truly believe in life after death and that family relationships are eternal and last beyond the grave. I also believe that family or friends of those who are at deaths door wait until the persons spirit has left their body to help them through the transition from mortal life to a life as a spirit. I believe that we lived as spirits with God before the earth was created and that God made a plan for us, as His children, to return home to Him. Birth (when a spirit enters a mortal body to give it life) was a part of His plan as well as death (when a spirit leaves a mortal body no longer giving it life). And although our mortal bodies are no longer living once the spirit is no longer animating them, our spirit lives on and is eternal. Which is why your mother could see your dad right before she passed.